If you read David Levithan and John Green's novel Will Grayson, Will Grayson, you probably remember Tiny Cooper, the enormous gay football player who loves musical theater almost as much as he loves both Will Graysons (one platonically, the other romantically). 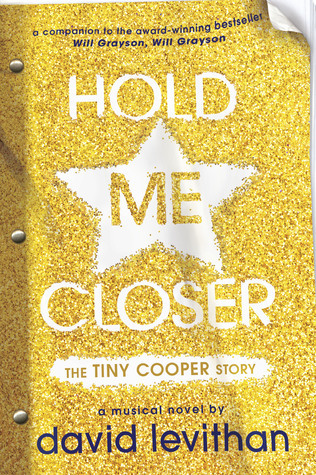 The most heartfelt parts of WG, WG come during the production of Hold Me Closer, Tiny Cooper's life in musical theater format. If you ever wanted the script for the entire play, Levithan has now provided that for your reading pleasure. Okay, so I know a forty-year-old woman is not David Levithan's target audience. I get that. I also get that when kids become caught up in the world of a story, they want as much of that story as possible. That's why my kids will spend their hard-earned allowance on the Gods and Monsters supplement to the Rick Riordan books. But this is the second Levithan book in a row I've read that I expected to advance a story I really enjoyed (the other being Another Day) that basically just recapped the story from another perspective. This might work for a fifteen-year-old fanboy, but it doesn't work for his mother. In fact, it just feels lazy.